As I reported yesterday, Japanese astronomer Masayuki Tachikawa recorded on video the impact of a small asteroid or comet on Jupiter's northern hemisphere on August 20 (early August 21 in Japan). The optical flash of the meteor streaking across the Jovian sky was also seen by two other Japanese astronomers, Kazuo Aoki and Masayuki Ichimaru. 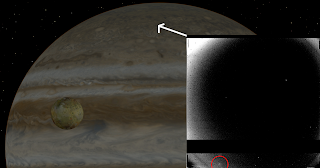 Both astronomers imaged Jupiter, again using webcams connected to their telescopes, during the impact event and recorded the optical flash of the fireball. Kazuo Aoki's recording allows a more precise estimate of the timing of flash to within a second of 18:21:56 UTC on August 20. Having more than observation of the event provides a confirmation of the observation and eliminates other potential sources of the flash, such as nearby artificial satellite. Isshi Tabe has a webpage up where he is collecting the observations from various astronomers across the western Pacific of this impact event. More information on the methodology of these observations as well as links to images and videos can be found on his website. Kelly Beatty reports over at the Sky and Telescope website that Imke de Pater and Heidi Hammel were also observing Jupiter using the 10-meter Keck II telescope in Hawaii. They did image the impact region during their two-day run, but in their initial look at the data, they didn't see anything new such as an impact scar. The impact occurred when the Sun was already up in Hawaii, so they most likely didn't observe the actual impact. As I pointed out yesterday, this is the second fireball to be seen in Jupiter atmosphere this year, after only two previous impact event seen from Earth, in 1994 and 2009 (though the latter was only seen after the impact). This doesn't mean that impact events are somehow occurring more frequently. The discoveries this year are helped by the method many amateur astronomers use to record their observations and built up high-quality images. Because they tend to use smaller telescopes than most professionals, they are limited by the amount of light their telescopes can collect. This lowers the signal-to-noise of their observations. Increasing the exposure times is fine for faint targets, but for bright targets like Jupiter, that will just over-exposing the data, limiting their usefulness. Instead, they use USB cameras (webcams) to record video of their target of interest at 20-60 frames per second. Software is then used to stack the numerous frames they record to build up images with a much higher signal-to-noise ratio than each separate frame. This is akin to how we take images of Titan's surface, where we acquire 3 images of Titan's surface at 938 nanometers and then sum them on the ground. These webcam videos, taken by numerous amateur astronomers from around the world also have the side benefit of allowing them to detect transient events like meteor fireballs in Jupiter's atmosphere, which would have been difficult to detect otherwise. With so many amateur astronomers taking long videos of Jupiter, the likelihood that an impact event is detected is improved. 1) Regular observers: Please can you tell me: On a typical night, how many minutes of video do you record and look through? 3) Maybe someone could devise software for scanning the webcam videos and identifying these fireballs automatically?? With these measures in place, perhaps more impact events will be recorded and detected going forward. This information will scientists to estimate the impactor flux in the Jupiter system. With some modeling, this can further improve our age estimates for the surfaces of Io and Europa. On Isshi Tabe's website, he also points out that Christopher Go found a reference to a Voyager 1 observation of a fireball. The paper is by A. Cook and T. Duxbury and is titled, "A Fireball in Jupiter's Atmosphere". It was found while the spacecraft was eclipsed by the Sun, shortly after the Io encounter on March 5, 1979. The Voyager narrow-angle-camera was using this opportunity to image Jupiter's night-side with limited contamination from sunlight to search for lightning and meteor fireballs. They were able to find one fireball, in Jupiter's high-northern latitudes, with an absolute magnitude of -12.5 and a path length of 75 km (image c1639630 from 03/05/1979 17:45:24 UTC). Cook and Duxbury mass of the impactor was 11 kg. Assuming an impact velocity of 64 km/sec., the flash occurred over a period of 1.17 seconds, which is on the same order as the meteors seen this year from Earth. From their observations, they suggest that the number density for objects larger than 3 kg is a factor of 6 less than the estimate obtained from terrestrial meteors. Additional modeling and observations from ground-based telescopes should help to pin down this estimate. And there is ... yet another flash-on-Jupiter paper in the literature: Hammel & Nelson describe in Nature 366, 117 (1993), how Io suddenly brightened during an observing run, apparently illuminated by a bright flash on the far side of Jupiter. My understanding is that had been debunked. Basically if Io brightened due to a flash on the night side of Jupiter, the impact would be large enough that you would CLEARLY see an impact scar on Jupiter. Immediately after the June 3 impact I contacted Hammel: She stood by that (widely un-cited) paper and actually hoped that it would now be taken more serious than at the time. If you have an actual "debunking" reference, please post! Regarding the lack of a 'scar' which should indeed have formed after such an impact note that the monitoring of Jupiter in 1983 was vastly inferior to what's possible (and done regularly) today - the CCD revolution came only about 5 years later. I'll need to do more reading up on this. But IIRC, it was debunked as a result of the LACK of detection of an Io brightening from the impact of the SL-9 fragments. So if Io brightened as a result of an impact on Jupiter, it would need to be bigger than the SL-9 fragments, making a scar VERY visible, enough to be detectable by the tech of 1983.